The Microsoft Lumia 950 XL can trace its family roots to the Nokia 808 PureView, one of the most impressive cameras in history. It uses many of the same buzzwords too - a PureView sensor with a hybrid design (supporting both 4:3 and 16:9 photos with minimum cropping), ZEISS-certified lens, it has OIS and a bright f/1.9 aperture. The camera comes with extensive manual controls with a convenient UI and can shoot RAW photos. Note that while shooting RAW limits the resolution of the stored JPGs to 8MP, the RAW photo is shot at the full 19MP (that's for 4:3 photos). Rich capture slows down shot-to-shot time somewhat, but that's because it does a lot behind the scenes. It automatically triggers HDR when needed and in the dark it enables Dynamic Flash - a unique feature that lets you tune the strength of the flash after you have taken the photo. And the Lumia 950 X L has an impressive tri-LED flash to boot. Lossless zoom is available at 8MP, it allows you to do 3x magnification without impacting the image quality. The Live Images feature enables the camera to capture a short video along with photos. The video plays back automatically when you get to the particular photo in the Gallery app, but such a Live Image is pretty hard to share as you can only open it via the Windows 10 Photos app (Mobile, Desktop, or on Xbox). The Apple iPhone 6s Plus camera is less impressive in specs - a 12MP sensor and not-so-bright f/2.2 aperture. Still, previous iPhones were some of the best shooters around, and they had a more limited setup. 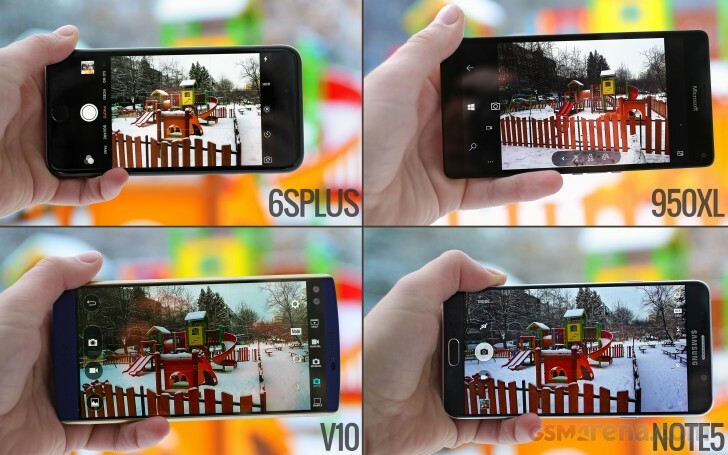 And the Plus has OIS (unlike the small 6s). Live Photos captures a 3-second of video at 14fps whenever you snap a photo. You can easily play back the associated video just by touching the photo in the Photos app, but, again, sharing on anything outside the MacOS ecosystem is quite a challenge. The Samsung Galaxy Note5 has a 16MP widescreen sensor with a f/1.9 aperture (matching the Lumia) and OIS. It has a single LED for flash, though, while the iPhone comes with two. The Galaxy Note5 has manual controls and RAW capture (and the JPGs come out at full resolution). One of the camera's special powers is live broadcasting to YouTube. There's also selective focus (simulate shallow depth of field) and virtual shot (which lets you walk around an object as you shoot).